I put your name into the image, YOU PRINT! This is a DIGITAL File ONLY! NOTHING WILL BE MAILED! 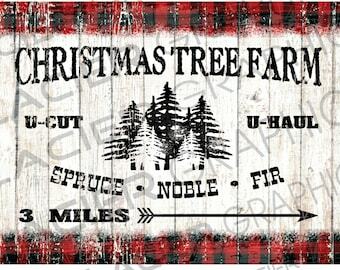 Customized LARGE FORMAT Vintage Rustic Country Farmhouse Style Christmas Tree Farm Sign - DIY Digital Download Printable Collage Sheet Digital Download Printable DIY Tags Scrapbook Graphics Collage Sheet Clip Art Retro Images. Vintage Ford Truck Sign. Nothing will be mailed. This is an electronic download. 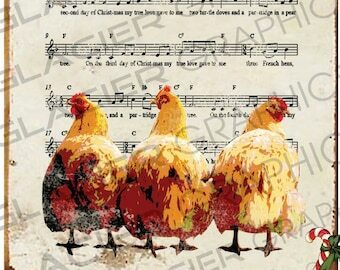 This listing is for 2 DIGITAL images - High resolution - 200 dpi JPG. Images can be scaled down using your print settings. **When ordering, be sure to give me the name you want in the image in the notes to seller on checkout. Within 48 hours, I will send you the proof of your design. If the proof looks good, you can immediately save it to your computer. If it needs changes, let me know. Files will not have my watermarks. You MAY use these images for (non-digital) light commercial purposes. You MAY NOT re-sell this image as is or as your own work either in print or digital form. My images MAY NOT be used on tee shirts, or other items sold on Print on Demand (POD) websites such as Zazzle, Greeting Card Universe, and/or Cafe Press. 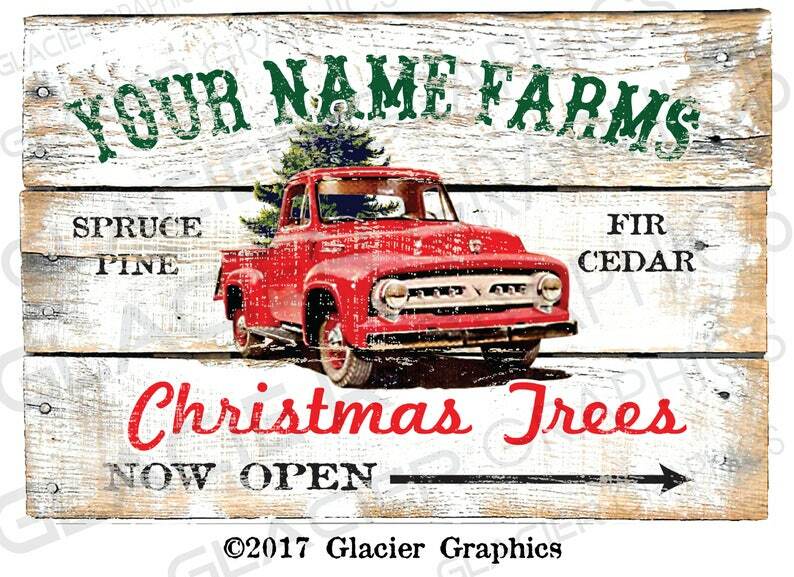 Credit to WAGlacierGraphics on Etsy as your image source is required with a link back to my shop here at https://www.etsy.com/shop/WAGlacierGraphics on your listing page. The image copyright remains with me after purchase. © 2017 Glacier Graphics. All rights reserved. Thank you so much! And for doing custom work so quickly!!!! We accept all major credit cards, and Etsy provided payment methods. If you need to pay via PayPal, we are set up to accept payment that way also. Thanks! Once delivered, the files are yours and I cannot accept any returns. If you have an issue with any of the files, please let me know and I will be happy to supply another one. 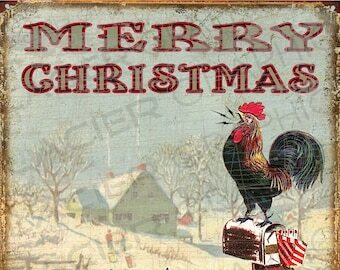 Most of my DIY design files will be delivered through a digital download after payment. Personalized logos and designs will be e-mailed (or a link to the files) after your name and information have been added. 1) I work out of my home. I do not have a business phone. I do not do phone consultations because I do not want to give out my private phone number to those I do not know. 2) Etsy recommends not doing business over the phone due to lack of documentation in case of a disagreement, and opening sellers up to harassment. 3) If you need personal help with a design, please contact a graphic artist that is in your area. Shop local, keep everyone happy and financially secure. • Personal use on personal birthday invitations, posters, card designs, etc..
• Educational use i.e., school projects, posters, printed lesson page, etc..
• Non-commercial use which includes any products that are not for sale. • Small commercial use that does not generate profit such as banners, logo, signs, flyers, brochures, advertisements, business card, t-shirts, etc..
• Credit is not required but very much appreciated. • Commercial labeling of handmade items up to 100 with a link back to my shop featured in your listing. If sold offline, my shop website should be on the item or a tag on the item. • Claim the designs as your own. • Distribute, copy or reproduce the file as is. • Use the clip art or logo to create your own clip art or logo for sale. 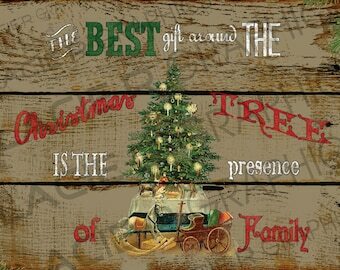 • Use the clip art or logo for freebies (share for free). • Sell this work as a digital product or physical product - for example in a CD or DVD. • Use the clip art or logo on commercial products for Zazzle or any print re-sale service. For exclusive copyright, please contact me and I can sell you the transfer of rights agreement - where I agree to submit all intellectual and property rights to you, the buyer - $199.00. From that point on, the logo or design will be exclusively owned by you, and I as the designer of the logo or artwork, will not reproduce or resell the logo design ever again. I will however, keep the logo design in my portfolio for presentation work. WAGlacierGraphics retains the copyright of all images, illustrations and logos featured in my shop, and cannot be copied, reproduced or resold by any other party unless express permission is granted by me.